On February 21 to March 3, Oakland teachers went on strike for better wages, smaller class sizes, and more funding for specialized education. Teachers have asked for a 12 percent increase over 3 years, smaller class sizes (most classes had more than 30 students per teacher), and less caseloads for specialized education, which include psychologists, speech therapists, counselors, nurses, and more; however, OUSD offered only a 5 percent increase in pay, and very small cuts in class sizes and caseloads for specialized education. Because teachers and special educators and staff have so many students, it is hard for them to give the attention the individual attention and guidance students need. Oakland teachers are some of the lowest paid teachers in the Bay Area even with benefits, and many of the students under OUSD are from disadvantaged backgrounds – many are of racial minorities and low socioeconomic status. Already the students have difficulties in getting access to resources, and the insufficient funding of the public schools make it even harder to access vital resources that schools should be able to provide – education, counseling, special education, and others. Because of the low wages, it becomes difficult for Oakland teachers to maintain a living in the expensive city of Oakland, resulting in problems with teacher retention; OUSD loses 18.7% of its teachers every year, which is much higher than other school districts in the state. Charter schools were created in Oakland with the intention to create more options for the education of the students of Oakland and provide a different educational experience from the traditional public schools. However, a fact-finding report reveals that the underfunding of education creates inequities within the Oakland educational system, particularly in relation to charter schools. Both charter and traditional schools gain revenue based on daily attendance; if attendance levels decrease, their revenue proportionally decreases. However, traditional public schools have to pay fixed legacy costs that do not reflect attendance levels, which results in more funding going into legacy costs instead of into students’ educations, while charter schools do not have the extra legacy costs and still retain more funding for their students. In addition, the current model is that the federal and state governments mandate certain special education services but do not provide enough funding to achieve those mandates. Because of this, general education funding is used for special education, and as a result, general education students get less funding than before. The OEA believes that Oakland charter schools enroll disproportionately less students that need special education services, which leaves more general education funding per student, despite data suggesting that there has been an increase in students in need of special education services in Oakland. Because of these inequities, students have an “uneven playing field”, and often have to compete for resources that every student should be entitled to. To combat the underfunding of public school education, many Oakland teachers striked, and some Oakland students participated in “sick-outs”, costing OUSD millions of dollars while classes were led by temporary substitute teachers. OEA claims that OUSD is overspending on administrators and not for the education of students. 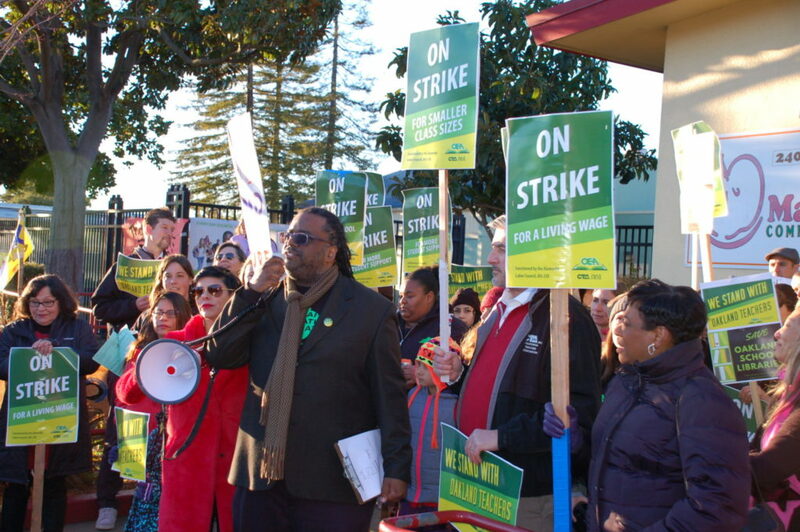 An agreement was reached on March 3, 2019 after days of negotiations; Oakland teachers were able to get 11 percent wage increase of 3 years, cuts in class sizes, and smaller caseloads for education specialists. However, because of these increases, OUSD had significant layoffs, specifically for youth case managers who help students in foster care. These layoffs have negative impacts, especially for youth under foster care; more than 200 at-risk students under foster care rely on the guidance and help of youth case managers. In fact, since the hiring of more foster care youth case managers, the number of students under foster care suspended from school dropped by 75%. It was even suggested to cut out Asian Pacific Islander Student Achievement program(APISA), a program that works specifically with API student populations in Oakland schools, in order to handle the new raises. This Oakland teacher strike is just one of many teacher strikes that have rippled throughout the U.S.; in 2019, teacher strikes have occured in Los Angeles, Virginia, Denver, and Chicago for better working conditions and better pay for teachers, and more funding for public education. However his 2019 budget, Trump proposes to cut $3.7 billion in education and increase spendings for defense by $80.1 billion. However, some progress has been made, as California governor Gavin Newsom proposed 80.7 billion dollars for K-12 education and a second year of free community college, as well as an expansion of preschool and kindergarten programs. This is an issue that affects us all; millions of students across the U.S. go to public schools and it is a big part of our lives. In this national movement for better education and improvement in the employment of our teachers, we must all gather in solidarity with our educators and advocate for better wages and working conditions. With hope, we must all look towards the future and demand for change for the better. Please check out the previous blog post “The Fight for Student Visibility and Equity” to learn more about YAC’s experiences at the OUSD board meeting negotiations. This entry was posted in Current Events and tagged api, apicommunity, equity, oakland, ousd, public schools, schools, strike, unity. Bookmark the permalink. The views and opinions expressed on thatsnotlove.org are those of our youth leaders only and do not necessarily reflect the views of API Legal Outreach or the Youth Advisory Council.